Today I have an adorable retro feel Christmas card to show you!! 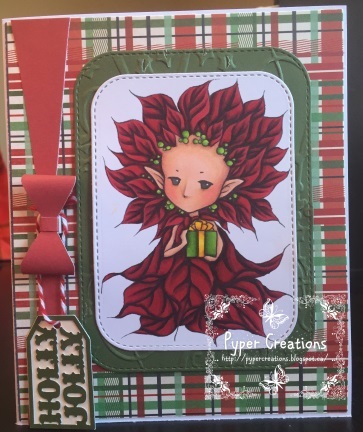 I used this super sweet Poinsettia Sprite from Aurora Wings to be the focal on my card. Then I used some My Minds Eye- Comfort and Joy papers along with CTMH Cranberry and New England Ivy cardstocks to create this super cute card!!! And to finish it off I used my CTMH Artiste and Artistry cricut cartridges to create the bow and cute little sentiment tag!! Thanks for popping in to see what I made today! I really really am looking forward to seeing all your Christmas creations the next few weeks!!! 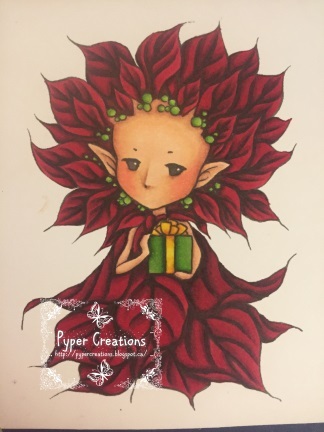 I also want to Thank all of you and the Fantabulous Cricut Challenge Blog DT for following along with me this last year!! This will sadly be my last DT post for Fantabulous and I just want you all to know how very much I have enjoyed my time with this team and playing with all of you!! Thank you so much for an amazing year of creative inspiration!! Such a beautiful image. Stunning card. Love this gorgeous card! Thanks so much for being part of the FCCB design team! We will miss you <3 Hope you have a wonderful Christmas! !